On the 12th of March, Wells Fargo CEO Tim Sloan had to face a griling by the U.S. House Financial Services Committee. 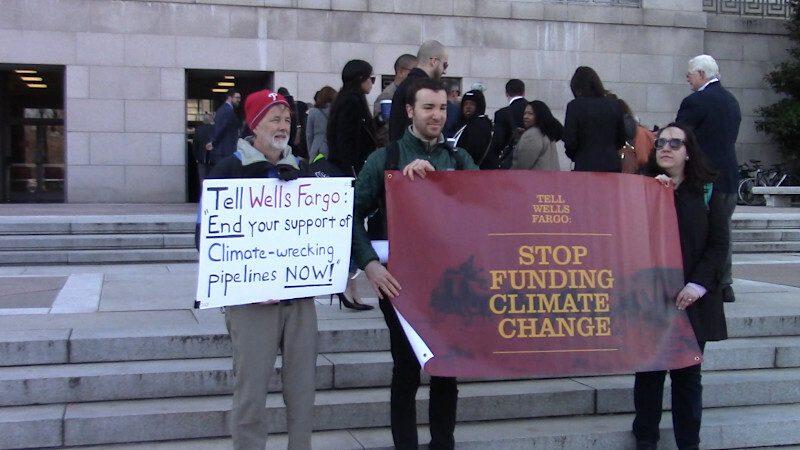 Outside the Rayburn Building, protesters displayed a banner demanding Wells Fargo "Stop funding Climate Change" with their investments in oil, pipelines and fracking. While Wells Fargo has long been known as perhaps the dirtiest of dirty banks, even they have been forced to concede on another issue: private prisons. The Washington Post reports that many banks have stopped funding private prison operators GEO Group and CoreCivic in the wake of ICE/CPB family separation mess and close association of ICE detention with Trump. Another bank dumped the private prisons after one too many home demos at an executive's house, and according to the Post even Wells Fargo is no longer renewing contracts with CoreCivic and GEO Group. Public presure and outrage have made investments in private prisons so toxic, so hard to stomach that even Wells Fargo is puking them up, one expired contract at a time. Protest WORKS! Pipelines, fracking, dirty gas and oil are next, and coal is already on its way out the door because it can't compete even with fracked gas. As the hurricanes howl, the seas rise, and farms either dry up and blow away or flood, fossil fuel investments may soon become just as toxic and "unbankable" as privately-owned ICE detention centers have become. Already banking experts warn of "stranded assets" such as fossil fuel deposits that have to be left in the ground for climate reasons, and brand new pipelines that find no customers after just a few years of use. Now is not the time for banks such as Wells Fargo to throw good money after bad in such questionable investments.